Stop fires fast – just point and spray. 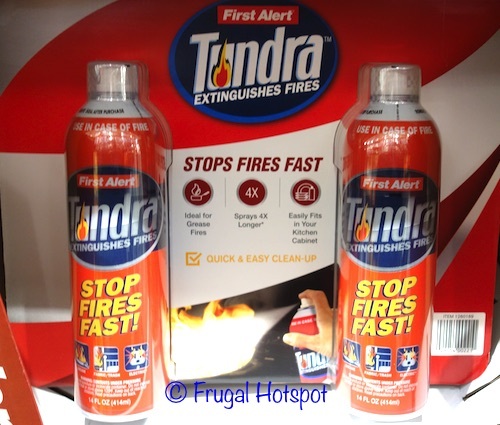 Select Costco locations have the First Alert Tundra Fire Extinguisher 2-Pack on sale for $14.99 (after instant savings), now through March 12, 2019. That is $5 off Costco’s regular price of $19.99. While supplies last. Price, participation, and sale dates may vary by location. Item #1260169. This product was spotted at the Covington, Washington Costco and includes two 14-ounce spray cans. • Covers a wider surface area than a typical actuator. • This fire extinguisher works on household fires including those involving paper, fabric, wood, cooking oils, electrical appliances and equipment. • Easy cleanup – simply wipe it away with a damp cloth.